Steak N’ Shake doesn’t serve turkey patties, so three years ago Ohio State men’s hockey forward Nick Schilkey celebrated Thanksgiving with a thin slab of beef and blended ice cream. Schilkey’s experience, while seemingly unorthodox, was not unusual for a hockey player in the United States Hockey League. 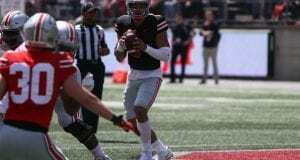 On Thursday, the Buckeyes reveled in a similar experience. The team ate Thanksgiving dinner on the road before it plays in the Shillelagh Tournament in South Bend, Ind. 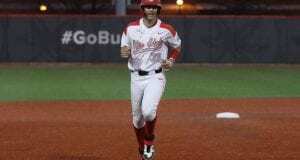 The Buckeyes are scheduled to play Western Michigan University on Friday and either Union College or the University of Notre Dame on Saturday. For many of the Buckeyes, celebrating Thanksgiving with their hockey team is no longer abnormal as they’ve been living away from home since their pre-college years playing junior hockey. Johnson still receives familial performance reviews from his father who watches recordings of every game. The strain extends to the coaches as well. As OSU won’t return to Columbus until Sunday, Rohlik will miss spending Thanksgiving with his wife and three children. But while the burdens of the sport can be tedious, there are advantages to living with the team. Some players, for example, received two turkey dinners this season. When Canada celebrated Thanksgiving in October, the parents of junior defenseman Sam Jardine came to Columbus to cook for the Canadian players, Fritz said. 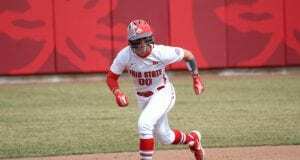 The Buckeyes were thankful for their 3-0 win against Michigan State last Friday. When the team returns on Sunday, Rohlik said he’d begin cleanup duty with the Thanksgiving leftovers. OSU is set to faceoff against the Broncos on Friday at 4:05 p.m. in South Bend, Ind. 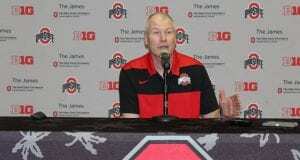 OSU will have one non-conference opponent remaining on its schedule after this weekend. Freshman forward Matthew Weis (upper-body) and sophomore forward David Gust (undisclosed) are day-to-day. Sophomore goalie Matt Tomkins will start on Friday, Rohlik said.